Cross-curricular teaching and entertainment in one Nobel volume.These days, interdisciplinary projects and cross-curricular interlinking of learning are all the fashion, and stressed teachers sigh in frustration over the tour de force of teaching not only their own subject, but of successfully implementing relevant connections to other areas as well in order to make learning more meaningful to an increasingly lazy, naughty and careless student body.Some might think this is a recent issue - both the emphasis on interdisciplinary learning, and the hopeless attitude of our youth. Think again - or read Selma Lagerlöf, and you will be pleased to discover that: a) your interdisciplinary project combining a learning unit in geography, biology, history, literature, ethics, Nordic mythology and life skills is offered to you on a Nobel silver plate.b) students have been lazy, naughty and prone to falling asleep over their chores or homework at least since 1906, when this novel was written to be used in the Swedish school system.Following young Nils Holgersson on his magical journey through the various landscapes of Sweden is a special experience, as it combines features of a fairy tale adventure with genuine geography and biology knowledge. Nils is cursed by a Swedish house spirit, a"tomte", for his cruel and treacherous behaviour, and is turned into a a tiny "tomte" himself. Deprived of his physical superiority, he faces the animals on his parents' farm, whom he has treated in a particularly nasty way. He discovers that he has received the ability to understand their communication as a compensation for his lost power, and he has to hear some unpleasant opinions about himself, as well as protect himself against the mistreated animals' righteous anger. Fleeing the farm on the back of a goose, he travels through all of Sweden. The journey widens his perspective and broadens his mind, and the hardship he faces makes him grow as a human being, - despite or because of his tiny size. He learns to respect nature and living creatures by slowly gaining deeper understanding of the diversity of lifeforms in Sweden. He returns home more caring and knowledgeable, and vows to be a better leader of the environment for which he is responsible. The curse is gone, and he resumes his human shape.Apart from the purely subject-related content, offering a panorama of Swedish flora and fauna, it is a universal story of power and responsibility, and of the importance of knowledge to develop empathy. To respect others, you need to know about their situation, and about their needs and feelings and customs.Recommended to teachers, students and learners for life! There are three very good reasons to read this book - the author is first woman ever to win a Nobel Prize, it appears on Le Monde list of best books of 20th century And the fact that the protagonist's picture appears on 20 Swedish krona banknotes. The talking animal surpass those of Kipling's Jungle Book in detail and characterization, and they are also talking about such subjects like deforestation and industrialisation. And there is additional flavour of histories, local folktales and legends. “The Wonderful Adventure of Nils Holgersson,” is a Swedish children’s classic. Published in 1906, the book actually resulted from a commission from the National Teachers Association to write a geography reader. Author Selma Lagerlof apparently spent three years studying Nature and also investigating folklore and legends from around the country, before writing this book.The story itself involves a fourteen year old boy called Nils who is a bit lazy and naughty. Amongst the mischief he gets up to is the rather unpleasant way he likes to hurt animals on his family farm. One day, he is left home to memorise Bible chapters and then falls asleep. Waking, he sees a gnome, which he traps. Eventually, he is also turned into a gnome and able to talk to animals. With wild geese flying over the farm, a farm goose attempts to fly off with them and, when Nils grabs hold, the two of them end up on an adventure…This book involves a lot of the history and natural world of Sweden, which is a beautiful country. At just over 270 pages and with an illustration at the beginning of each chapter, this is certainly a book for the more fluent child reader; although it is also delightful to read aloud. 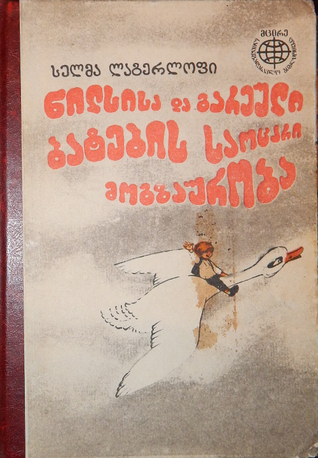 It has a lovely, hardback cover, with pictures of flying geese and is an unusual story. It reminded me a little of BB and his, “The Little Grey Men go Down the Bright Stream,” if not in the actual storyline, but in the way the countryside and natural beauty was so integral to the book. A lovely novel for adults and children. This book will give you so much. How is it that Swedish writers always find the right words for expressing children's thoughts and feelings? Lagerlöf does a great job, not only in describing the Swedish landscape, but also in describing and telling Nils' story. It is a wonderful piece of literature and should be read to every child. You can learn a lot from Nils Holgersson. It deals with topics different to speak about, like death, sickness or growing up. And while writing about it in such a unique manner, she manages to teach children values like friendship and trust. Absolutely adored it. A big book, but full of nice stories of the wonderful adventures of Nils, a boy who was turned tiny and went on a trip on his goose (or was it a duck, I can't remember?) But what I do remember is that the book had some magical stories to tell. Especially loved the one with the magical city and the one with the deer. I was about 10 years old, and looking for something to read on a quiet Sunday afternoon in summer, when I ran across a battered and faded copy of The Wonderful Adventures of Nils. Originally published in Sweden in 1906-7, it tells the story of a naughty farmer's lad who has what we would today call attitude, toward his parents, toward farming, and toward the animals on the farm. He's a terror, in short, and his parents despair of him. An elf turns him into a tiny version of himself (just go with it), and he's nearly eaten, crushed, or lost hundreds of times on his subsequent journeys around Sweden in the company of a marvelous flock of geese. Of course he learns wonderful lessons along the way, about himself, the animals and birds that suddenly loom much larger in his life, and the land he travels through. Lagerlof was an early environmentalist, as well as an intellectual with theories about bringing up children, and a deep knowledge of Sweden's geography. I was entranced, and tore through the book on that long, rainy afternoon. Then, over the years, I forgot about Nils, until a combination of Sunday, rain, and the search for a good book brought back a faint memory. Google did the rest, and I was delighted to find that the book is still in print, though hardly a bestseller.Too bad. It's quite brilliant, and while it was originally written to teach Swedish schoolchildren about geography, the descriptions of the places never get in the way of a good story. It's perfect for your 8 - 10 year old's bedtime reading aloud, though be warned that it contains real peril, death, and something of an education in the hard life of people making a living from the land. It's a book to raise your child's sights, imagination, and IQ. Este livro é uma verdadeira viagem através da Suécia, que deixa vontade de revisitar um país cuja paisagem é, apenas aparentemente, monótona. É também uma viagem interior, a do crescimento de um rapaz mimado e preguiçoso, que acompanhando a migração dos patos bravos através do país, aprende o valor do trabalho e da lealdade, como garante da sobrevivência do grupo. Com muitas notas sobre a vida selvagem (mesmo sendo os animais personificações), geologia, e alguma história, é um livro, ao mesmo tempo bonito, e informativo. Gostei muito. Visnotaļ pamācoša. Nekad, nekad nevajag kaulēties ar rūķīšiem. Bonusā vesela kaudze ar Zviedrijas teikām un Zviedrijas vēstures apskatiem. Uz beigām gan autorei pietrūcies par ko rakstīt, tādēļ iekļāvusi šo to no savas dzīves.Mierīgi var lasīt arī pieaudzis cilvēks, grāmatas valoda bagāta, stāsti interesanti. Vairāk tāda novadpētnieciska grāmata nekā bērnu pasaka. Un tais laikos jau autori nekaunējās aprakstīt dzīvi tādu kāda ta ir, nāve, netaisnība un nežēlība, tas viss te ir. Bet ir arī darbaspars, prieks un lepnums par savu valsti. Wonderful fantasy book for children or anyone who has not already read it. I read it several times over the last 70 years. Sometimes its the perspective of a child that gives adults much needed clarity. Without hyperbole, metaphors or euphemisms, this wonderful tale of adventure manages to show the complexity of nature and the abuse nature has gone through in the hands of humans. Selma Lagerlöf writes story about a boy who isn't always very nice and one day annoys an elf enough to get himself hit by a spell - the boy, Nils, can now understand animals and birds along with turning into a very tiny person. He travels across the country (Sweden) on the back of a gander and understands the nature through the eyes of birds.Thw wonderful adventures of Nils is definitely one of the best books I've read this year. Deze vakantie las ik onder andere ons maandboek van Selma Lagerlöf - Niels Holgerssons wonderbare reis. Dit boek won de Nobelprijs voor de literatuur in 1909, bijna een eeuw geleden dus. Deels in zonnig Zeeland, de rest in al even zonnig New York. Om me van daar te verplaatsen naar het Zweden van begin 20e eeuw was niet moeilijk!Het verhaal is in twee zinnen samen te vatten: dierenpestend rotjochie uit het zuiden van Zweden wordt in een kabouter veranderd en zal pas weer in een jongen terug worden getoverd als hij zich heeft leren gedragen. Hij vliegt een zomer mee richting het Hoge Noorden met een befaamde groep wilde ganzen, op de rug van Maarten, een tamme gans van de boerderij van Niels' ouders en beleeft allerlei avonturen voor hij weer terugkeert op het ouderlijk nest.De charme van het boek zit er voor mij deels in dat ik het landschap van zuid-Zweden ken (ik ben er een paar keer geweest). Zo is er een hoofdstuk waarin er sprake is van een bijzondere dierenbijeenkomst: de grote kraanvogeldans op de Kullaberg. En op die Kullaberg heb ik al drie keer gestaan. Wat een prachtige omgeving! De omschrijving klopt 100 jaar later nog perfect! En zo zijn er nog meer beschrijvingen van Skane (het zuiden van Zweden) die ik goed kon herkennen. Noordelijk ben ik nooit geweest maar ik vermoed dat ook hier de beschrijvingen vast nog vaak verrassend actueel zouden zijn.Het boek geeft een mooi beeld van het Zweden aan het begin van de 20e eeuw. Veel maatschappijkritiek (over bijvoorbeeld het werken in de mijnen), doorspekt met verhalen, mythen, sagen uit/over de verschillende landstreken. Hier en daar ook ontzettend gedateerd en één verhaal zou nu echt niet meer kunnen (een verhaal over de immer onbetrouwbare zigeuners, de Taters).De uitgave die ik las is versierd met prachtige tekeningen van Anton Pieck, die absoluut een hoop aan het verhaal toevoegen.Mooie schrijfstijl bovendien. Vaak worden allerlei uitroepen herhaald:'De eersten die de wilde ganzen die dag zagen waren de mijnwerkers op Taberg, die erts braken uit de bergwand. Toen ze hen hoorden kakelen, hielden ze op met het boren van hun loopgraven en een van hen riep de vogels toe: "Waar gaan jullie heen? Waar gaan jullie heen?" De ganzen begrepen niet wat hij zei, maar de jongen boog zich over de ganzenrug en antwoordde in hun plaats: "Daarheen waar geen houweel of hamer is!" Toen de mijnwerkers die woorden hoorden, dachten ze dat het hun eigen verlangen was, dat door het ganzengekakel heen klonk in mensentaal. "Neem ons mee! Neem ons mee!" riepen ze. "Van 't jaar niet, van 't jaar niet!" riep de jongen. 'En zo komen ze dan langs arbeiders van een papierfabriek, die ook niet meemogen naar daar 'waar geen machines of stoomketels zijn' en de arbeidsters van de lucifersfabriek niet naar daar 'waar geen kaarsen of lucifers nodig zijn' etc. etc.Selma komt zelf ook nog even langs, waardoor je een idee krijgt waarom ze dit boek schreef: 'Maar nu moet ik vertellen hoe wonderlijk het was dat er juist in dat jaar, toen Niels Holgersson rondvloog met de wilde ganzen, een vrouw was, die er over liep te denken een boek te schrijven over Zweden, dat geschikt zou zijn voor kinderen om op school te lezen.' Het boek wil niet vlotten, tot ze een gesprekje heeft met Niels, die haar zijn avonturen vertelt, en voilá, het boek over Zweden is geboren. Leuk gevonden!Al met al: nog immer zeer lezenswaardig! Nils Holgerssons wunderbare Reise von Selma Lagerlöf, illustriert von Lars Klinting ist ein schönes Kinderbuch mit wundervollen Bildern. Das Buch, das ich gelesen habe, hat nur einen Umfang von 92 Seiten und ist zum einen stark gekürzt (die originalen Versionen haben bis zu 400 Seiten) und zum anderen ist das Buch für die jüngeren Kinder gedacht. Das Original soll düsterer, kritischer und ernster sein. Dies hier ist jedoch auch für die Kleineren geeignet, es ist zwar mitunter spannend, aber es geht immer gut aus und lässt sich gut (vor)lesen. Die einzelnen Geschichten sind zwar durch die Kürzung nicht nahtlos aneinander angefügt, sondern etwas holprig, eignen sich aber dafür auch für kürzere Leserunden, wenn man einfach immer nur ein Abenteuer erzählen mag als Gutenachtgeschichte. Die Version ist sehr schön bebildert. Nils Holgersson ist ein kleiner, sehr frecher und mitunter fieser Junge, der Tiere quält und ärgert und seinen Eltern Scherereien macht. Dafür wird er in ein Wichtelmännchen verwandelt und geht mit den Gänsen auf Reisen. Dabei erlebt er einige Abenteuer und erkennt nach und nach, was helfen und gut sein heißt, was Freundschaft ist und vieles mehr. I read this for a Scandinavian Children's Literature class in college (surprisingly, one of the best classes I've ever had--thanks Elizabeth for suggesting it). I read several really interesting books in this class and this one is the story of a Swedish boy, Nils, who sees the whole of Sweden and learns about Swedish geography while flying on top a goose. It was originally commissioned by the National Teachers Association as a geography reader for the public schools. I wish the American school system did stuff like that. رغم اني مللت قليلا من الوصف المسهب لطبيعة السويد , و لكن لا بد من الاعتراف ان القصة خفيفة دم جدا , و خيالية جدا , و تقدم الكثير من الحكايات الشعبية الجميلة في داخلها , و العلاقات الرقيقة .. تستحق القراءة بكل تأكيد .. I loved this book so much as a kid. And that's the first book I've tried to read in Hungarian, as a 6 year old (Romanian being my native language, and Hungarian my mother-tongue). El mejor libro para un niño de 6 a 10 años. Lleno de imágenes, lecciones de amistad y humildad. Y su redacción fluida, sencilla. The Wonderful Adventures of Nils was a pleasant surprise for a number of reasons. I did not expect a great story mostly because in 1902, the Swedish Ministry of Education commissioned Selma Lagerlof to write the adventure as a way to make geography a bit more entertaining for school children. As a result, I thought the didactic purpose behind the book would result in a didactic story.It was anything but! This is an entertaining story. I did not know the location of places where the adventure takes place. Those who do not know Swedish geography should not let their ignorance dissuade them from a great read. It might help to have a map to look at.The story is a morality tale. What is a morality tale? It's many things and often involves a change of heart in a key character, who was once bad, is pulled into an adventure, realizes the errors of his/her ways and turns good.In the Lagerlof story, the chief delight of Nils Holgersson, the boy who forms the center of the work, is to eat and sleep, and after that he likes to make mischief. He takes great delight in hurting the animals on his family's farm. After an elf shrinks Nils into a small person who is able to talk with animals, they are thrilled to see the boy reduced to their size. While this is happening, wild geese are flying over the farm on a migration north for the spring, and a white farm goose attempts to join the wild ones. In an attempt to salvage something before his family returns, Nils holds on to the bird's neck as it successfully takes off and joins the wild birds. Off Nils goes on his adventure across Sweden.Knowing that a book is a morality take would prevent many from reading "The Wonderful Adventure of Nils," but this is a good morality tale in part because it is so entertaining. There is danger--mostly from a fox and crows--enchantment and the slow maturation of Nils from a uncouth ruffian into a man.I especially liked two sections, including one where Nils, one night in a grotto on the sea, discovers a mystically beautiful city. It's a vision of Plato's Golden City. After visiting the city, Nils goes to fetch a friend to show him Elysium, but he discovers that he cannot return to the city. He receives a one-time vision of perfection. Despondent by his loss of paradise, Nils is flown by the geese over a real, dilapidated city, and the boy realizes something: It's better that the mystical city of perfection is shown to only a few fortunates so that it doesn't decay like a real city would. Moreover, the brief vision of perfection can serve as a guidepost to Nils for life in a world that mirrors the dilapidated city.I also loved a section where Nils discovers an old peasant woman, who has been abandoned by her children. It's incredibly sad and makes Nils realize how blessed he is. I plan to return to that section in the future when I get down.Many 20th Century fantasy works emerged from the UK, including those by George McDonald, JRR Tolkien, CS Lewis and others. I enjoyed The Wonderful Adventures of Nils in part because the story emerged from outside the English-speaking world. Central Europe's fantasy tradition, via ETA Hoffman, the Grimm Bros. and others, is a bit older than Western Europe's. Ό,τι πρέπει για τα Χριστούγεννα. Ταξίδι προς την Άνοιξη! Μου άρεσε ιδιαίτερα που ο θάνατος ήταν κάτι συνηθισμένο, κάτι απολύτως φυσικό σε αυτό το βιβλίο. Se lo leería a mis hijos; es una historia preciosa con un final esperanzador. Hace tiempo supe que existía una historia acerca de un niño que viajaba sobre un pato. Nunca supe más detalle, cómo viajaban, si el pato era gigante o el niño pequeño, en qué territorios se movían o por qué lo hacían. Luego supe que tal historia era conocida como el viaje de Nils Holgersson. Más adelante me topé con un ejemplar y me decidí a leerlo. Me costó mucho trabajo al principio, me parecía lento y creo que la doble columna de Porrúa no me ayudaba mucho.Poco a poco le fui tomando gusto, me tardé y me tardé bastante, pero debo decir que el resultado fue agradable. Primero entendí que Nils se había hecho pequeño, luego por qué viajaba, y a lo largo de las páginas fui aprendiendo que a través del año de su viaje, Nils creció y lo hizo sin darse cuenta. Conoció lo largo y ancho de su país, Suecia, a sus habitantes, sus industrias, sus campos, bosques, y sobre todo, sus leyendas, tradiciones e historias. Me parece una labor muy digna de reconocerse la que emprendió la Sra. Lagerlöf al recuperar una enorme parte de la cultura sueca y traducirla a una historia fantástica dirigida a que los niños la aprehendieran. Me gustó mucho cómo va hilando estas historias y narraciones en el marco del viaje de Nils, incluyéndose de forma nada velada. Sin duda cumple su cometido.Me pregunto si yo hubiese sido un niño sueco cuál sería mi apreciación de esta obra. Seguramente la habría leído en la primaria, quizás me habría parecido una tarea aburrida, quizás me habría apasionado, no lo sé. Pero seguramente habría aprendido grandes cosas del país acompañando a Nils y a los patos silvestres. Fairy tales, myths and legends and the beautiful description of the landscape of Sweden, that's all included in this phenomenal book. Together with Niels Holgerson and the wild geese the reader makes a long journey from the south of Sweden to the land of the Sami people. There are many ancient Swedish folktales and legends, stories about animals and their habitat and tales about Sweden as the land develops itself to an industrial nation. It wasn't the first time I read it. Year ago I used to read for my school kids, but because time to read is limited during a school year I don't think I have finished it. The tales are - when looking at it from our point of view - moralistic. Niels is a very unruly boy, who is punished for this behavior by a little gnome. He is turned into a hobgoblin and leaves his house with a tame goose and a bunch of wild geese. During his journey he learns to develop good virtues. All is well, that ends well, when he returns with the tame goose and shows to be loyal to their friendship, when his parents want to kill the goose. The moment he steps into the room to keep his parents from killing his friend, the spell is broken and he turned into a normal boy again. Being fond of folktales, fairy tales, myths, legends and fantasy stories I loved to re-read it after so many years. Selma Lagerlöf კარლო კობერიძე დ. ჯაბუა - Selma Ottilia Lovisa Lagerlöf was a Swedish author. In 1909 she became the first woman to ever receive the Nobel Prize in Literature, "in appreciation of the lofty idealism, vivid imagination and spiritual perception that characterize her writings". She later also became the first female member of the Swedish Academy. Born in the forested countryside of Sweden she was told many of the classic Swedish fairytales, which she would later use as inspiration in her magic realist writings. Since she for some of her early years had problems with her legs (she was born with a faulty hip) she would also spend a lot of time reading books such as the Bible.As a young woman she was a teacher in the southern parts of Sweden for ten years before her first novel Gösta Berling's Saga was published. As her writer career progressed she would keep up a correspondance with some of her former female collegues for almost her entire life. Lagerlöf never married and was almost certainly a lesbian (she never officially stated that she was, but most later researchers believe this to be the case). For many years her constant companion was fellow writer Sophie Elkan, with whom she traveled to Italy and the Middle East. Her visit to Palestine and a colony of Christians there, would inspire her to write Jerusalem, her story of Swedish farmers converting into a evangelical Christian group and travelling to "The American Colony" in Jerusalem.Lagerlöf was involved in both women issues as well as politics. She would among other things help the Jewish writer Nelly Sachs to come to Sweden and donated her Nobel medal to the Finnish war effort against the Soviet union. Outside of Sweden she's perhaps most widely known for her children's book Nils Holgerssons underbara resa genom Sverige (The Wonderful Adventures of Nils).